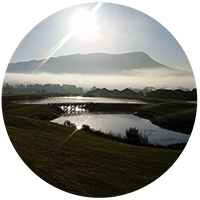 Lakeview Golf Club is an outstanding 27-hole golf facility just east of Harrisonburg, VA. Each of our 9-hole courses — Lake, Peak, and Mountain — offers varied characteristics that make the experience fun, fair, playable, and challenging for golfers of all skill levels. The service-friendly atmosphere and professional staff foster enjoyment of the game at any level. Lakeview plays host to many of the area’s top golf events and has an outstanding practice complex for long game, short game and putting practice. Get ready for the complete golf experience at the jewel of golf in the Valley. Lakeview is located just a few miles off I-81 at exits 245 & 247.